I find it truly extraordinary the way family and friends connect with each other today. Staying in touch through Facebook, Twitter, or Skype has made it very easy to stay up-to-date with the lives of the people closest to us. While there is a lot of unnecessary noise on social media channels today, I still believe that they are still great tools if used correctly and graciously. I have had the pleasure of talking about my faith on both Facebook and Twitter. I love sharing what God continues to do in my life. The blessings of that "online life" are the countless messages and responses from individuals telling me that they want to know more about Jesus. This is a privilege that I never take for granted. Do you ever feel the same kind of calling? Do you want to use a powerful online tool like Twitter to expand your influence? 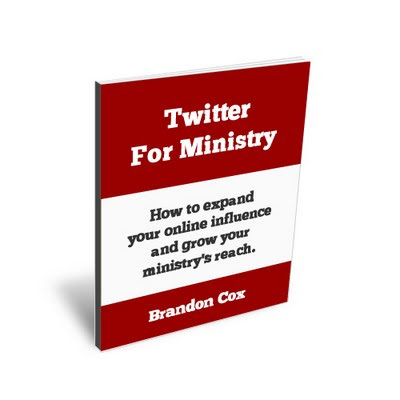 Saddleback Church pastor Brandon Cox wrote an excellent 35-page e-book called "Twitter for Ministry: A Guide to Expanding Your Ministry's Influence on Twitter." I read it one sitting and I strongly recommend this to anyone who would like to expand one's ministry with this online communication technology. I will honestly tell you that I am an affiliate of this material. But I assure you of this, I believe that this e-book must be read by anyone who wants to use Twitter as a means of reaching out, building relationships, and creating meaningful engagement. It costs $10 and available for immediate download on your favorite digital reading device. I promise you that it is a worthwhile read. If you would like to know more about "Twitter for Ministry" and purchase your own copy, please click here. I hope that you read it, be blessed by it, and let me know what you think of it.